Hello WineCollective. This is Jeremy Foster from Beertopia bringing you up-to-date as to what’s happening in and around Alberta in terms of Craft Beer. As a contributing member of CAMRA (The Campaign for Real Ale) for over 17 years I have come to love craft beer and the people that brew it. We all know the big international beers can be pretty tasty but I like to stick close to home and keep things local. Beers produced in Western Canada are now being honored as some of the best beer on the planet. My goal with Beertopia is to help bring people to new beers… pretty simple right? I thought so. So let’s get down to business – Spring Time Beer! Spring time is when many micro-breweries in Canada bring out their best beers. Typically a 12-pack sampler is released with 3 regular-lineup brews and a seasonal. 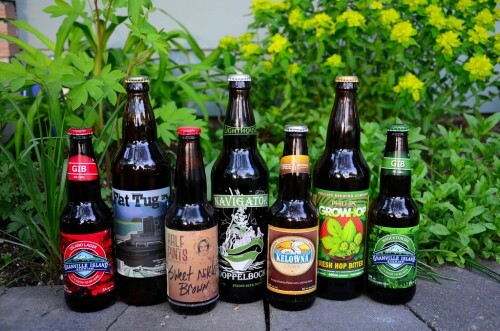 This year is no exception with Okanagan Spring Brewery‘s Craft Variety Pack. This sampler contains the always popular Spring Pale Ale, the 1516 Lager, the Brewmaster’s Black Lager and the new seasonal Hopped Lager. If you are a lover of darker beers, the Black Lager is excellent with a great coffee, roasted malt flavor up front with a very clean, smooth and a slight hop finish. The Hopped Lager is definitely a session beer for those warm spring or summer days with a crisp lager taste up front and a strong but not too bitter hop finish. Another excellent sampler to look for is the Half Pints Brewing Sampler pack. This brewery situated in Winnipeg, Manitoba has been turning heads with its unique craft beers as of late and if you haven’t tried any of their beers, their sampler is for you. This sampler consists of the St. James Pale Ale, Little Scrapper IPA, Bulldog Amber Ale and the new Stir Stick Stout. With Spring time comes BBQ season and what better way to compliment your “grillables” than with some excellent local craft beer. We all know how good it is to wash down some steak or kabobs with your favorite pilsner but many people haven’t approached cooking with the same beer! Some ideas are to marinate your steak or pork tenderloin with a heavier stout or porter while chicken can be soaked in a hefeweizen or a spicier Saison. The ever popular “beer can chicken” is also a great way to guarantee perfectly grilled meat while impressing your friends with your grilling ingenuity. Spring is also an exciting season for Beer Events in Calgary with the annual Calgary Beer Festival and a new premises opening for Craft Beer Lovers. The Calgary International Beer Festival ran May 27-28 at the Big Four building in Stampede Park. This year boasted some great breweries from out-of-province such as Mt. Begbie Brewing from Revelstoke B.C., Laughing Dog Brewery from Ponderay, Idaho and (a big favorite of mine) Bowen Island Brewery from B.C. The Craft Beer Market is a new tap-house boasting over 100 taps of craft and internationally famous beers. Located beside The Whiskey nightclub in the old Mother Tucker’s premises, Craft Beer Market (opening June 1, 2011 – today!) will be a haven for connoisseurs of craft brewed beer. However you decide to spend the warm evenings during the Spring time in Calgary – remember to think local and drink local! 2 for 1 California Wine Tasting Deal!